Pirate Galaxy is a free browser based MMO game where you can step into the shoes of a space pilot in a war against the horrifying Mantis. Go on dangerous missions, upgrade your spaceship and form alliances with other human players to fight the Mantis threat. 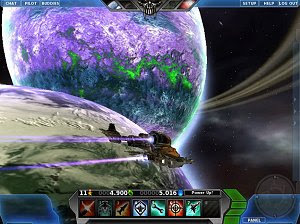 Pirate Galaxy features superb 3D combats in real-time, both in space and ground. The universe to explore is huge, with dozens of star systems filled with distinctive planets to discover and conquer.